It can be quite frustrating... when your mind is set to cook a one particular dish... then upon running through the ingredients and found that the dish require that certain something... sauce or some fancy fresh produce!!! and equally frustrating when you drove all the way to the stores (be it Woollies or Coles or IGA) and they dont have it on the shelf... very frustrating indeed!!! Have you had that "moment"... when you go aaarrrggghhh...? Mix everything in a food processor and process into a paste. I never heard about this sauce, but similar to our chili pickle.. love the click & sauce looks so inviting.. Whole Foods carries it in their refrigerated section. 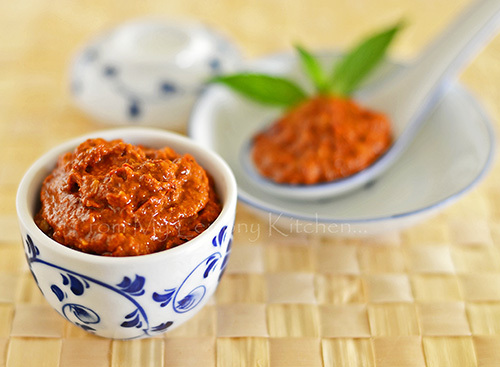 Originated fr Middle Eastern- Algeria and just like sambal to us. Whole Foods in Mt Lawley??? will check it out when I am in the area. try it with pureed roasted red peppers (capsicum) fantastic! Brilliant, I usually don't make this as it's available everywhere here in Spain. But, sometimes it's nice to provide homemade when guests coming. I'm just a show off LOL. I also have argh moments with harissa. In fact just had one on Friday. So glad I found your site, going to have to try this. I love your photo! It brings out the beautiful colour of the harissa! It's not surprising that so many recipes include it, it's very popular in Algeria (my country) and all of North Africa although usually served on or as a side to dishes rather than as an ingredient. I suppose the world likes to play with new ingredients in different ways! 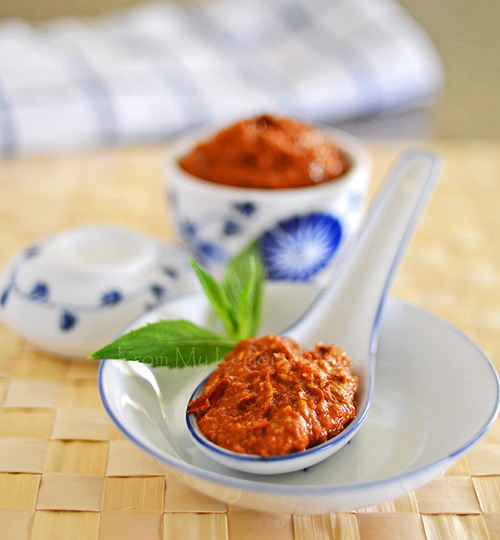 omgg i LOVE harissa!! There is a really good lebonese restaurant in NYC that i frequent called ilili and they havethe yummiest Harissa! Im definitely going to try your recipe! I used to modify recipes when running out of ingredients until my eldest son got wise....so I told him to cook instead! I ada one tube of harissa... was wondering it would be the same taste. Ah you're my hero! Going to be making this for sure. (PS: pretty photos).